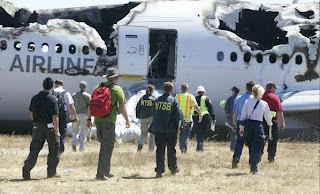 On 24 June 2014, NTSB Board members met to determine the probable cause of the July 2013 crash of Asiana Airlines flight 214 in San Francisco, CA, which resulted in the deaths of there passengers. The Board concluded that there were a number of probable and contributory causes for the accident, with many of them revolving around the crew's understanding of the aircraft's automated systems. On July 6, 2013, about 11:28 am local time, a Asiana Airlines flight 214, a Boeing 777-200ER (HL7742), struck a seawall while attempting to land on runway 28L at San Francisco International Airport (SFO). Three of the 291 passengers were killed, and 40 passengers were serious injured. All 16 crew members survived, but nine were seriously injured. The flight crew accepted an ATC instruction to maintain 180 knots until five nautical miles from the runway, but mismanaged the airplane’s descent, which resulted in the airplane still being above the desired three degree glide path when it reached the five nautical mile point. In an attempt to increase the airplane’s descent rate and capture the desired glide path, the pilot flying (PF) selected an autopilot mode that resulted in the autoflight system initiating a climb. The chosen autopilot mode, 'flight level change,' attempted to bring the aircraft to the selected altitude, which was above the aircraft's altitude at that point of the approach. Asiana’s procedures dictated that the approach must be stabilized by the time the aircraft descends to 500 feet above the airport elevation. The approach was not stabilized, and the crew should have initiated a go-around, but instead continued the approach.